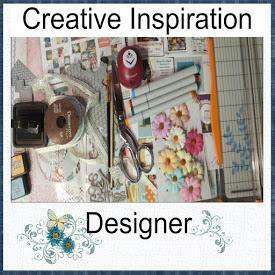 Today is my first day to post a challenge on Creative Inspiration. Wednesdays are stash challenge days and my challenge was to dig into their stash of photos and to use at least 6 photos from their stash on their layout. If they didn't have 6 photos to use at least 6 squares of paper with buttons or brads in the centers of their papers. Here is my inspiration for them.